I’ve always wanted a Porsche 917 in my collection, but never knew which to choose from. McQueen’s LeMans Gulf 917? Enginerrrrrrrrr’s Hippie car? Philiphilip’s 1970 winner? 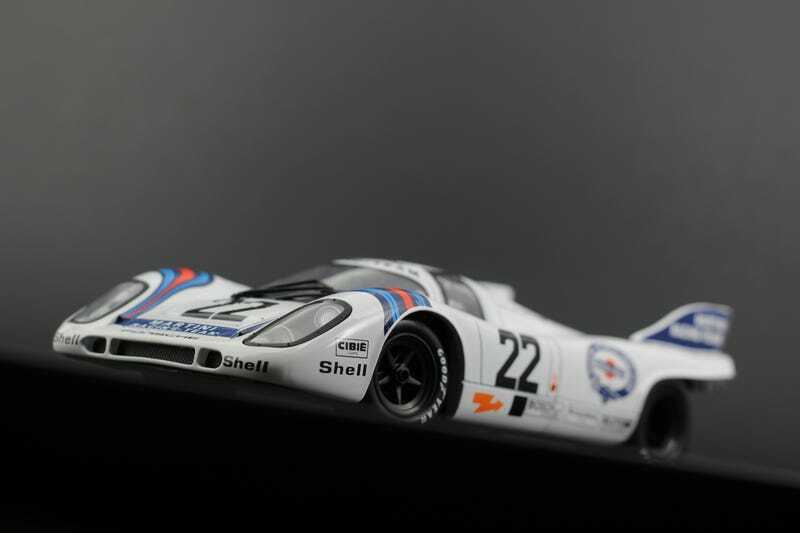 Ultimately I ended up with this white Martini liveried 917 that won the 1971 LeMans. A legend in its own right, this car was the first to ever cover over 5000km in a record setting run that would stand for 30 years. The car was driven by Dr. Helmut Marko (he had a PhD in being a badass, apparently) and Gijs van Lennep. After a disappointing and tragic outing in 1969, the 917 finally gave Porsche its first overall win at LeMans in 1970. This car here, a different 917 than the previous year, gave Porsche the repeat win in ‘71. This model is an older cast manufactured by Universal Hobbies under the brand Eagle’s Race. I happened upon this one hunting for diecast cars at the swap meet section of the Good Guys Nationals in Raleigh this past spring. Me and my LaLD buddy Roundbadge met up for the show, and he helped me decide which 917 to get. There was a vendor in one of the expo centers with rack upon racks of 1:18's. His prices weren’t the greatest, so I knew I had to make the right decision. There were several 917's to choose from, including the 1970 car winner from Norev. I knew the Norev cars were sealed diecast models, and the older UH cars were $20 cheaper. Plus, I fell victim to their blatant false advertising claim of opening parts. Its literally printed right on the window box, but none of the parts on this car actually open. It looks like I could take a screwdriver to the underside of the body to remove the tail, but Philiphilip had told me that there wasn’t much to look at underneath anyway. The selection of UH 917's came down to the silver Martini Sebring winner and this white LeMans winner. Both Roundbadge and I agreed that the LeMans winner was the cooler model to have. It was brand new in the package, but somehow its age was already showing. Some of the tampos had worn away in some spots and some of the stickers on the car were lifting. I may have overpaid at $80, but this model also doubles as a souvenir from that awesome afternoon spent with Roundbadge!